Add real credibility with your potential customers and/or combat those annoying negative reviews for less than the cost of an IPhone you can have 100+ great reviews. 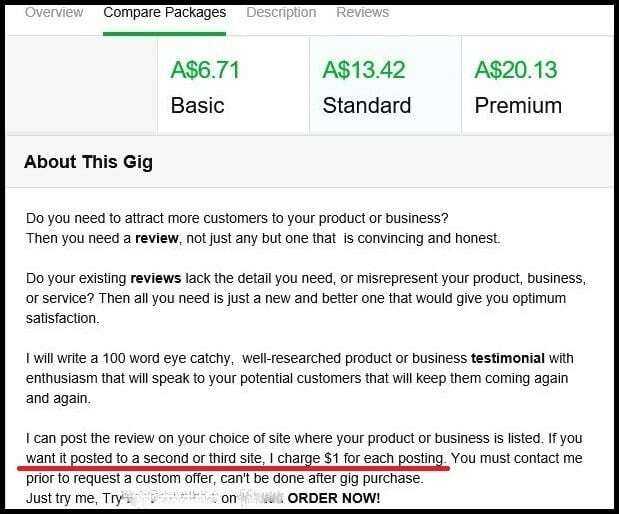 On one site the rate is AUD$6.71 per review. Some will add reviews on multiple sites for just $1 extra per site. 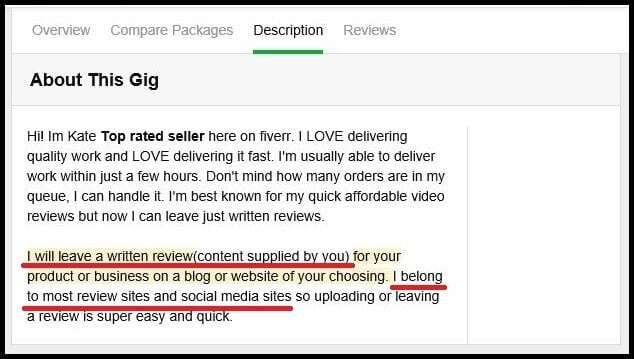 Others have groups to do multiple reviews cheaper. Or they’ll let you write your own review and then post it under their name, (not sure if lazy or cleaver). This has been happening on a large scale and expect to see a lot more reviews, as they will get you higher internet ranking, another benefit to buy reviews. Pic 1. Screen shot of $6.71 price to buy a review & add to extra sites for $1. 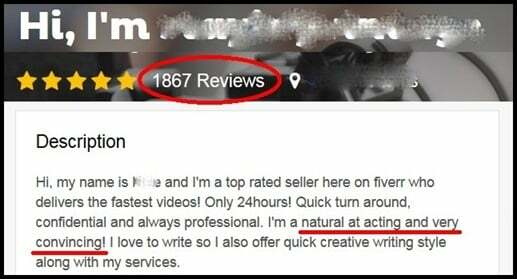 With only 1 search on this site we found 68 people offering Fake review services, (some offer multiple reviews, so you can buy 80 or more reviews on just 1 site). Finding the best fake reviewers is easy, as they have reviews of their service! Pic 2. This paid reviewer had 1867 reviews on the 16.3.17, by the 25.5.17 this increased to 2178 reviews, 311 new reviews in 10 weeks. If like us, only a very small percentage of customers leave reviews, business must be very good! Shops with very bad reviews, have greatly improved there average rating, and buried the bad reviews. If you had 7 really bad reviews, all 1 out of 10 stars, you have a 1 star average rating. Add 80 great reviews 8-10 stars (9 average), now you have an 8.5 star rating! Cost $536.80. 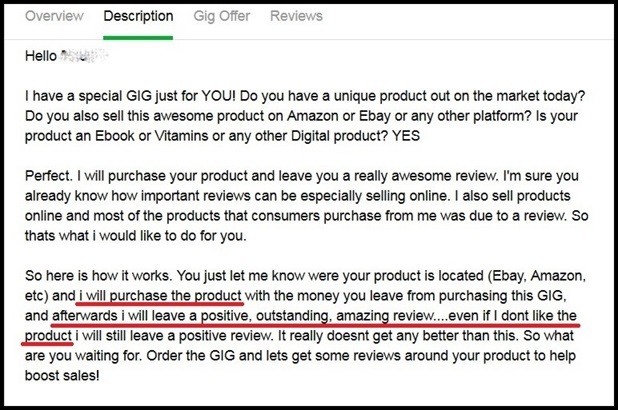 Note- Ringleaders will never buy reviews, even though it is so easy and common, we have ethics! Providing real quality jewellery and service is expensive, time consuming, requires real qualified jewellers very rare (see Buyer Beware- Jewellers so rare training to be terminated in Australia), also gemmologist, lapidarist and real dedicated, skilled, passionate people are hard to find. Pic 3. Will post Pre-written reviews. So the vast majority of “jewellers” lie and just sell Chinese and Indian factory made jewellery (see Buyer Beware- What are you really buying and from whom). – Weak, thin or excessively hollowed-out. – Why are these both VS Clarity. Pic 4. This reviewer will purchase the product and leave a positive, outstanding, amazing review…. Even if I don’t like the product. We often receive e-mails offering the service, there are many businesses who have been buying a large number of reviews, with several jumping from 2 – 7 reviews to 90 – 135 reviews over recent months.